In many rural villages and slum communities, families struggle each day without access to clean water and proper sanitation–in fact, 1 in 3 people in developing countries don’t even have access to a basic toilet. Inadequate health and hygiene practices mean infections and conditions such as diarrhoea are part of everyday life–and at their worst, can become life-threatening. Our community health program in India and Indonesia is working to combat that. With your support, we can train local women like Bebi to become health leaders in their community. Educated in illness prevention, basic first aid and nutrition, they then share their knowledge with hundreds of households in their villages, as well as helping these communities access the sanitation and medical facilities they need to keep their families healthy. 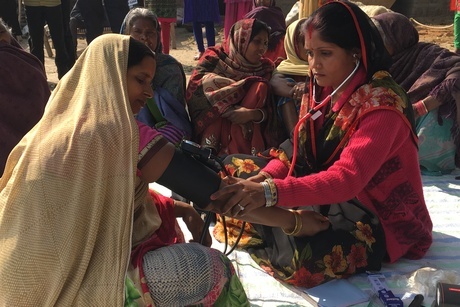 As a health leader, Bebi visits women in her village in India, educating them on the importance of washing their hands, drinking clean water, giving birth in hospital, breastfeeding and using sanitary napkins. She’s even helped hundreds of families install their own toilets. Your support can help train women like Bebi and build even more healthy communities throughout Asia. • Decrease sick days that prevent families from working and earning the income they need to break the poverty cycle. Please, will you help build healthy communities by training local women in life-saving health and hygiene practices? • Independent evaluations prove the training is working. Surveys show that 7 in 10 families are now regularly practising improved health behaviours such as washing their hands with soap and purifying drinking water.